The gift of pain also holds true for our relationship with all of God’s Creation, not just personal relationships. Only those who love animals and nature grieve when animals suffer and when the nature is harmed. Yet, few animal protectionists and environmentalists would prefer not to love and care. We do not celebrate our pain, and I think many of us wish we weren’t so sensitive to and empathetic with those who suffer. But, from this sadness springs compassion and love, which enriches our lives and makes us feel blessed. Sometimes, sadness can give way to a sense of despair, but Christianity also offers a message of hope. 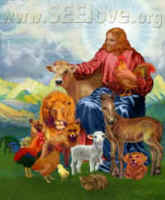 We may anticipate the eventual “Peaceable Kingdom” envisioned by Isaiah in chapter 11, in which all creatures will live peacefully together. In addition, we may take solace in the words of the Apostle Paul, who wrote, “We know that the whole creation has been groaning in travail together until now; and not only the creation, but we ourselves, who have the first fruits of the Spirit, groan inwardly as we wait for adoption as sons, the redemption of our bodies. For in this hope we were saved.” (Romans 8:22-24a) The grace of God’s redeeming powers offers us salvation.